Click this picture to see a photo gallery from several of our boat and kayak tours! This tour includes the luxury of a power boat to travel into the islands (up to ~30 miles out) and the adventure of paddling the sea caves in an inflatable kayak (optional). All trips include a US Coast Guard Captain, boat gas, life jackets and use of the inflatable kayaks. Your Captain will tell you about the islands, their history, and the geology of the area. 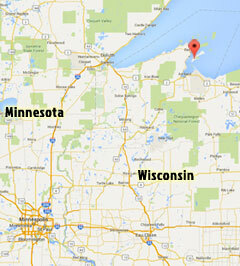 Our beach shop is located on Madeline Island, but departures can be from Madeline Island or Bayfield, WI. We offer morning and afternoon departures for our tours, although these are dependent on weather and availability of boats. We offer more tours than we have boats, so not every tour is available everyday; we schedule our tours on reservation-basis. We have a 4-person minimum on all of our tours and a maximum of 6 plus the Captain. If your group is smaller than 4, don’t worry! We match individuals, couples or groups of families or friends in order to make departure group sizes. People who take our tours are typically like-minded individuals, so there are usually no issues in the matching process! Please let us know if you have special requirements (i.e. no children, no pets, no waves) and we will ensure to match your fellow participants accordingly. While our maximum group size is 6 people per boat, we do have multiple boats that can travel together depending on availability. If you have a group larger than 6 we recommend booking well in advance so we can ensure multiple-boat availability on your tour date. You bring your snacks, food/beverages (please no glass! ), personal items and we will provide you an amazing time! When selecting your tour, remember that the geological formations on each island are unique. Check out our page on geological differences to make sure you choose the tour that’s right for you! This is our most popular tour – shipwreck, lighthouse and sea caves! We’ll depart from Madeline Island (or Bayfield) and motor past Basswood Island. From there we will view the Fedora Shipwreck – it’s been under water for over a hundred years. Then we pass Hermit and Oak Island on our way to view the historic Raspberry Lighthouse. Here it’s possible to leave the boat and take a quick tour of the lighthouse from one of the National Park rangers. After the lighthouse, we get to the Devils Island sea caves. Kayaking or sightseeing Devils Island is a premium opportunity; they are the most stunning sea caves in the archipelago. Pillar after pillar, room after room you can kayak through the million year old sand stone. On our return route, we will do an inter-island tour where you can lay your eyes on almost all the islands. A stop at the historic Manitou Fish Camp will enchant you with fisherman stories from a century ago. This tour is a memorable, amazing experience for a family and people of all ages. Click for the full photo gallery from our boat and kayak tours! *Some aspects of these tours, such as lighthouse visits and short tours of historic sites, are run by the Apostle Islands National Lakeshore and are offered by the Park Service, not by us. Therefore we ask for your understanding and flexibility when it comes to arranging these parts of the tour. At certain times of the year there are fewer rangers operating lighthouses and camps in the National Park and docks/lighthouses are sometimes under construction, which means it may not always be possible to visit lighthouses and other park-run attractions. The Park also charges small fees for some of its tours, ranging from $3-5 per person or $10 per family. They ask that each individual or group pays in cash before the start of their tour. 1/20/19 Update: The reservation system offers 4,6 & 7 hr tours but for 2019, we are only offering kayaking on the 5 hour tour length. Tour time is also subject to weather, which may need to be accommodated the night before or the day of your tour. We use 21-24 ft power boats, so we are subject to weather conditions. We are constantly monitoring the weather and dispatches from the Coast Guard to ensure safety on all of our tours. 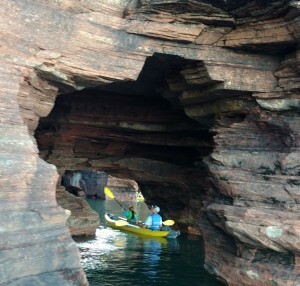 Sometimes, the weather on Lake Superior makes it difficult to head out to the caves on Devils Island. We are well prepared with backup options, however. Often, there is still the possibility of heading to Sand Island or Meyer’s beach to kayak in the unique sandstone sea caves at those locations. Please note this may extend the time of your tour, as those locations are further from our main route. This decision will be made at the Captain’s discretion and communication with your group. On our boat and kayak tours we use inflatable kayaks. For our inflatable tandem kayaks (Advanced Elements Straitedge 2) the weight limit is 500 lbs for the combined weight of two people, with a cockpit width of 35 inches. If you make a paid reservation over the phone, we will inform you of this weight limit. It is very important to be honest and not to exceed this weight limit. If you show up for your reservation and you are over the weight limitations, you will be unable to kayak. Please also keep in mind that you will have to be able to lift yourself in and out of the kayak to exit and enter the powerboat in open water. If you are unable to do so, the situation becomes dangerous for both you and the captain. Please make sure you do not exceed any of our limitations that are specified above. This is for your safety and for the longevity and structural integrity of our kayaks. Damage done to any kayaks due to the misuse or exceeding any limits explained will be at your expense. Once again, it is VERY important to BE HONEST with your weight. This is for life jacket fit and weight displacement on the boat and kayaks, not to mention the safety of your and our guides/captains. Dogs are allowed on tours however they require a check in with all the participants on board, to make sure all clients are dog friendly. Dogs also require a “sniff” test to see if they will cause a big stink on the boat. Dogs 15 pounds and under will be an additional fee of $15. Dogs between 15 and 49 pounds will have a $30 fee. Dogs 50 pounds and above take up a whole seat on our boats and will cost $60 per dog for the boat ride. Large breed dogs are not allowed on board (Great Danes, Mastiffs, etc). If the dog is not a large breed but is over the size of a standard lab, please give our shop a call and we will determine eligibility based on dog description. Please note there is no kennel service on the island, so please plan ahead for your tour.